Syncline Mountain from Highway 774. Peak 1 is in the centre and Peak 3 is on the right. 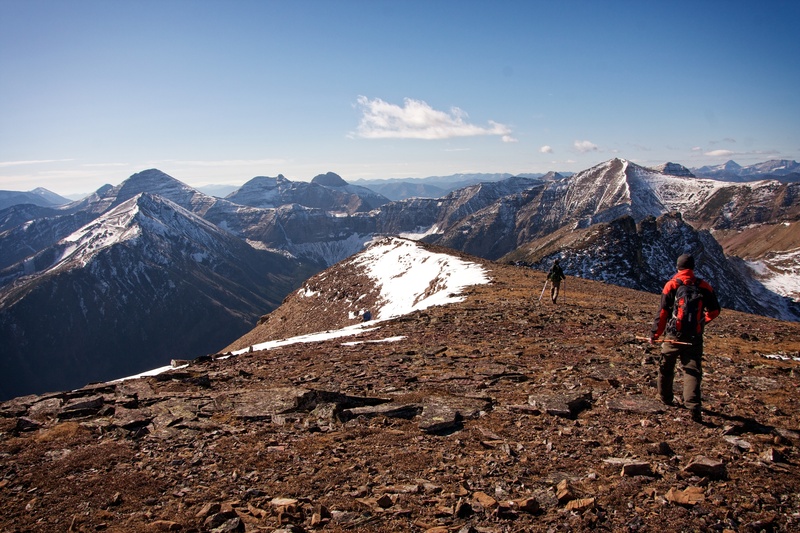 If you’re planning to climb a mountain in southwestern Alberta and the wind is ripping out of the west, it’s wise to pick one that has an ascent route up the east face. 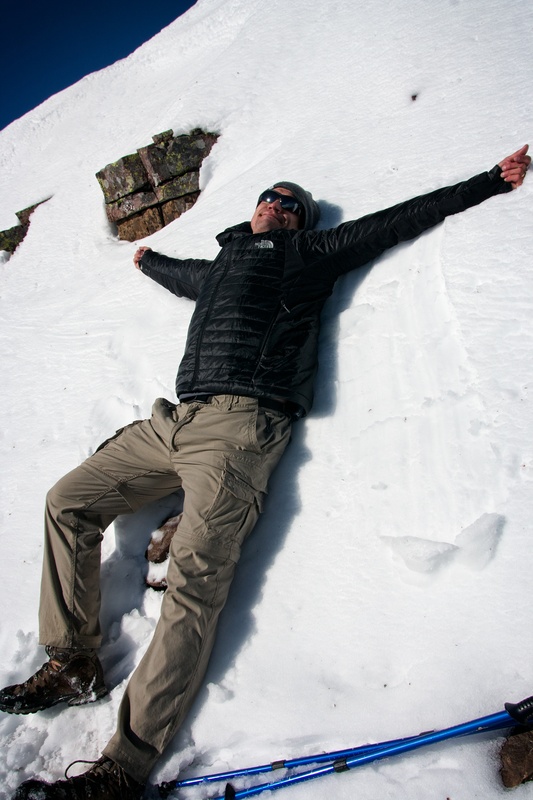 This way, you can at least enjoy some some shelter before you reach the summit. Once on the summit however, you are then at the mercy of the wind gusts which at times may pummel you with loose dirt, rock, snow, ice, patio furniture, small mammals, and/or small children depending on the locale. 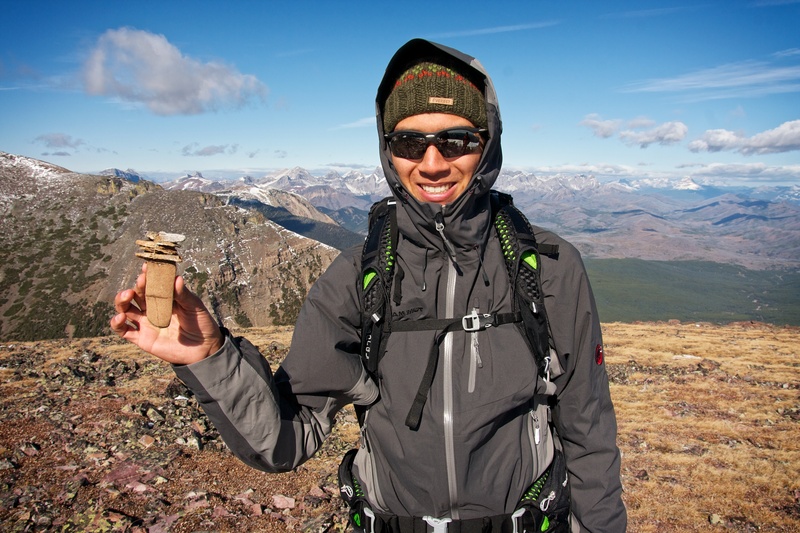 Ideally, the weather forecast will call for diminishing winds by the time you reach the summit and when this happens, it can make for a really enjoyable day. This was the case on Saturday, 4 October 2014. Jeff and I left Lethbridge just before 8 am and at that point we hadn’t decided on what mountain we were going to climb. 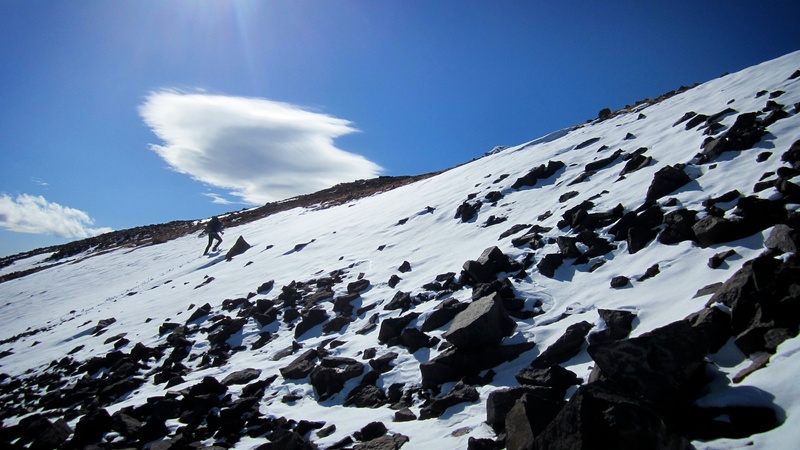 We just knew that it was incredibly windy and that we needed to pick a mountain with a sheltered approach. After tossing around several options during the drive, we decided on tackling Syncline Mountain in the Castle Crown Region. 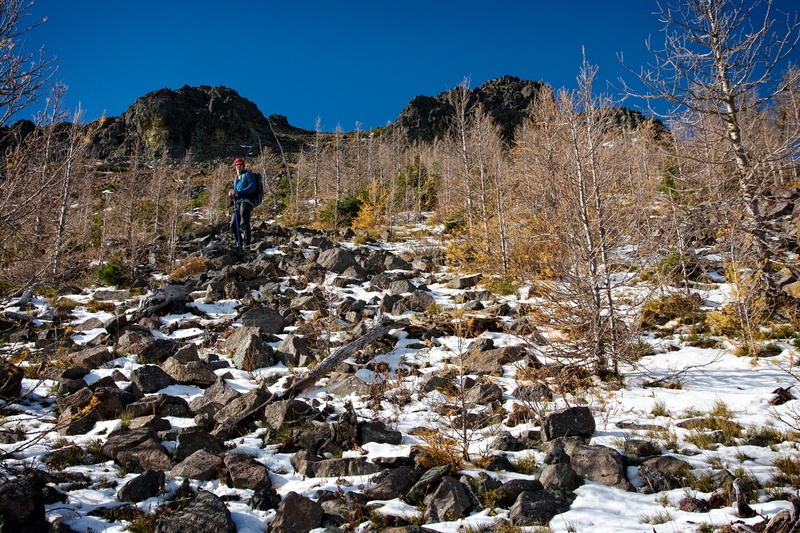 This however, would not be the first time that I had set foot on the slopes of Syncline. The last time that I was there was in August 2012 when I was accompanied by my two sons, Joel, and Nathan. On that hot August day, we had to turn back 3/4 of the way up the first peak after Joel suffered an asthma attack. Thankfully Joel was okay, but ever since then, I’ve had the desire to remove this mountain from my ‘close but no cigar’ list. 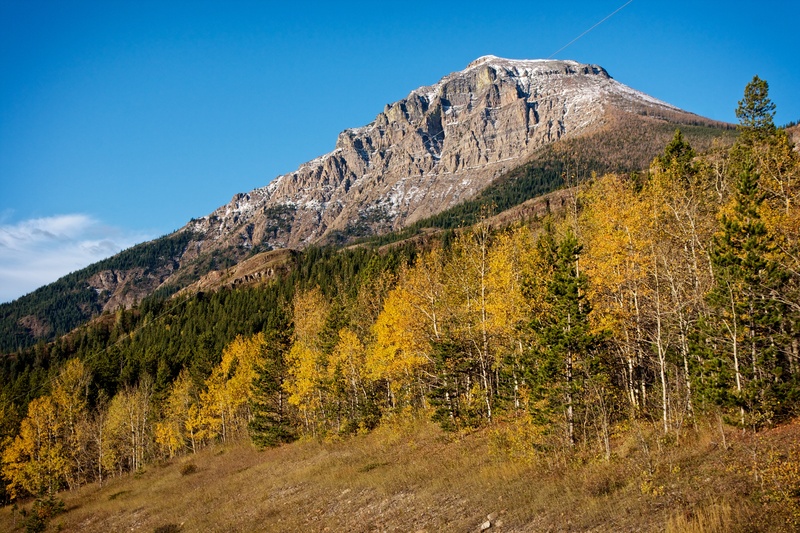 If you ski or board at Castle Mountain Resort, you will recognize the picture above because it means that you are getting closer to the ski hill. 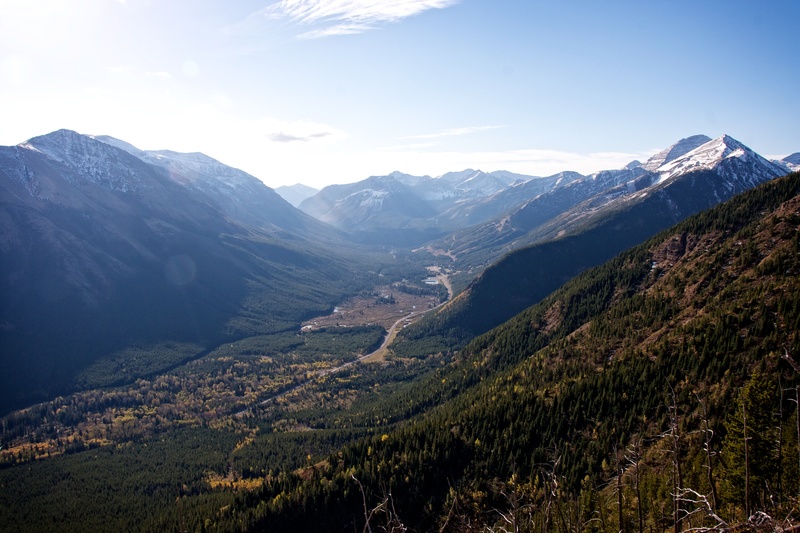 Syncline Mountain is located on the right hand side of Highway 774 to the immediate north of the ski hill (Gravenstafel Ridge and Mount Haig). Across the highway from Syncline is Southfork Mountain and Barnaby Ridge. 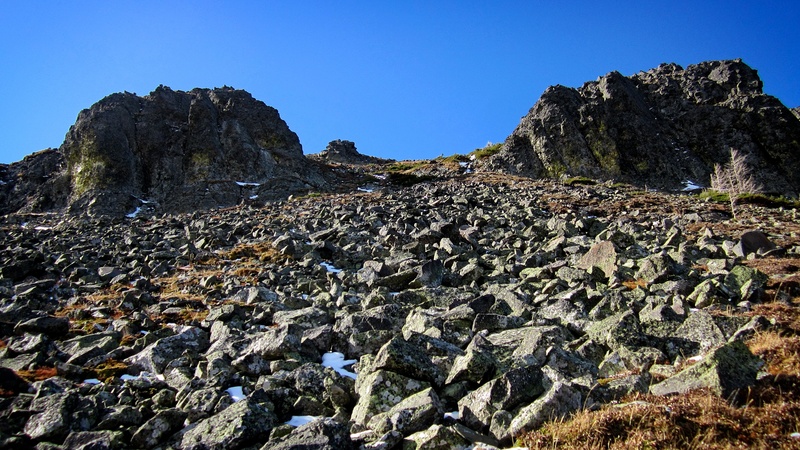 Syncline is an interesting mountain because it is comprised of three different peaks. The most common destination is the first peak which is located directly above Highway 774. Peaks 2 and 3 lie further to the west and require some time to reach from Peak 1. In fact, with the recent smattering of snow, it took us longer to reach the summit of Peak 2 then it did to reach the summit of Peak 1 from the highway. Joining us on this trip were Mark and Alex who are recent grads of the U of L and who have spent a lot of time climbing and hiking in the Crowsnest Pass. Mark had texted me that morning to say that he and Alex were going to climb Victoria Peak, but no sooner had Jeff and I pulled our vehicle off the road beneath Syncline, when Mark and Alex pulled in behind us. We were glad to have them join us and their company made the day even more enjoyable. Our route to the summit of Peak 1 was not unique as we followed Andrew Nugara’s directions in, More Scrambles in the Canadian Rockies. 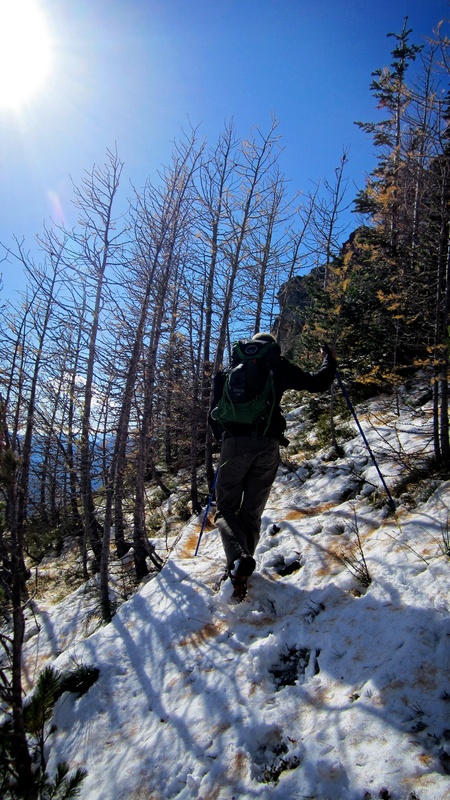 The route itself follows the distinct line of trees and larches up the northeast ridge to the summit. 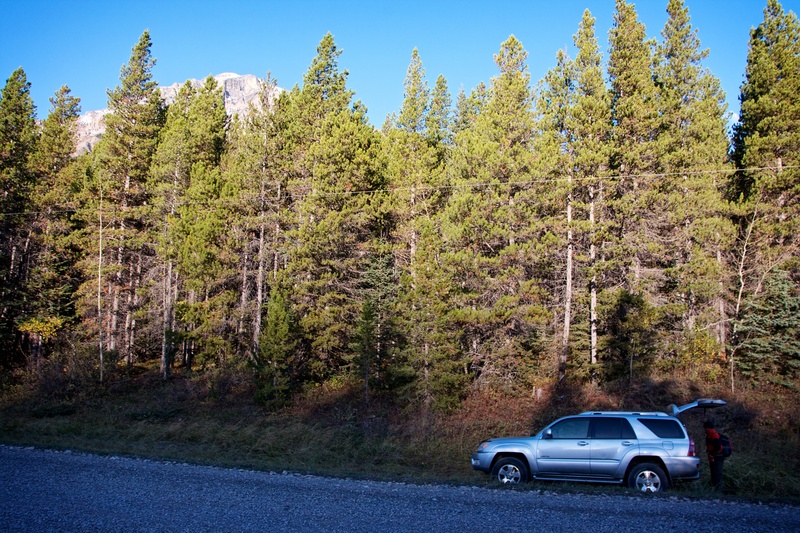 The only real difficulty is the amount of bushwhacking that you need to do between the road and gaining the ridge. Fortunately, the recent snow had taken care of much of the underbrush and it was a much easier trek through the trees then the last time that I was here. 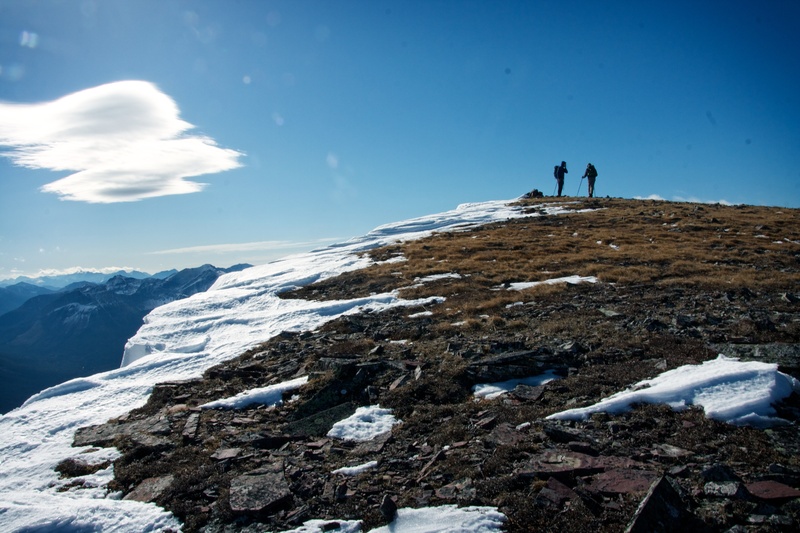 From the summit, we then followed the ridge and ascended the high point located between Peak 1 and Peak 2. After enjoying the views, we backtracked and descend beneath its sheer cliff walls and made our way to the col beneath Peak 2. From here it was a non-technical hike to the summit. The trek from Peak 1 to Peak 2 took us almost 3 hours due to the slippery conditions of the rock. We then scrambled down from the summit onto the connecting ridge between Peak 2 and St. Eloi Mountain which is located to the south. 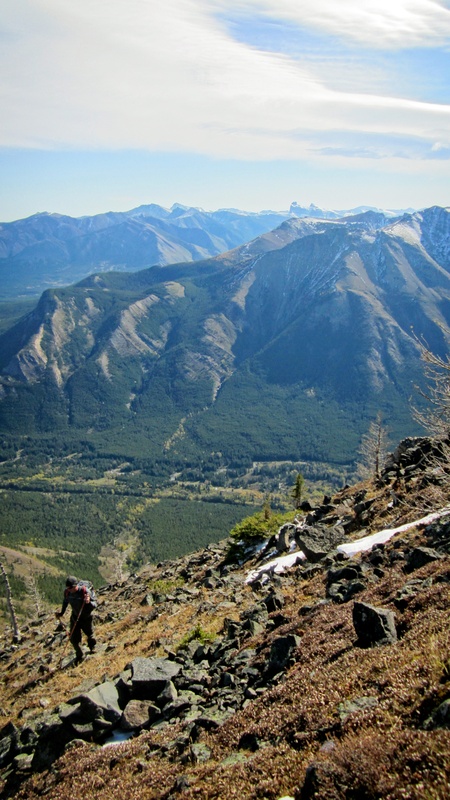 From the ridge we then descended down a washed out drainage to Syncline Brook which we then followed back to the Highway and then back to our cars. My GPS which had been holding steady on 1 remaining battery bar since the summit of Peak 2, obviously was struggling to maintain a signal during the final couple of kilometres as we walked back along the road as noted by the line wandering off the road towards the river. Despite the wind, it was a beautiful Fall day in the Castle Crown. Our ascent route went up the tree-lined ridge that is noticeable in the centre of the picture, leading towards the more gradual slopes on the upper right. Jeff gears up from our parking spot on a short ATV track next to the side of the road. 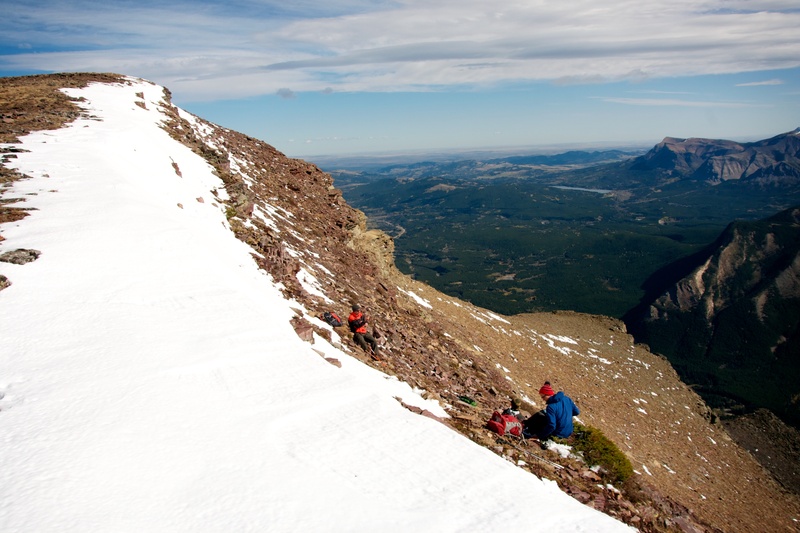 We chose this location because it looked to be the most direct access to the base of the ascent ridge. From here we would bushwhack through the trees until we reached the clear open slopes of the ridge. Mark and Alex would arrive just after I took this picture. 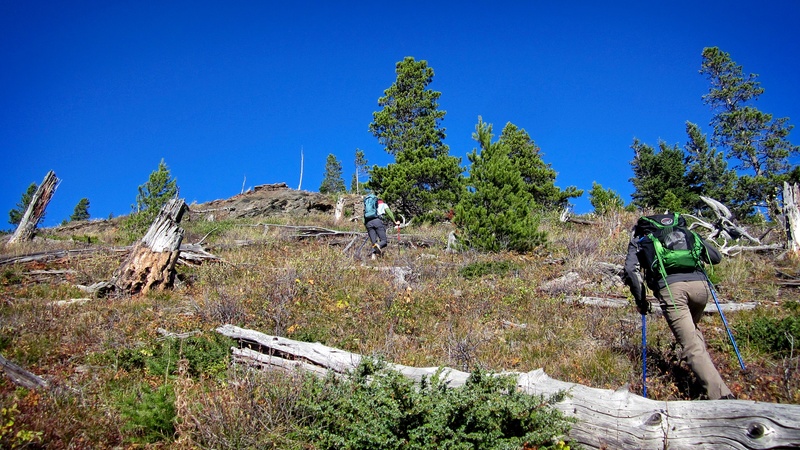 We reached the open slopes of the ridge after a 1/2 kilometre bushwhack through the trees. Fortunately, the recent snowfalls had crushed all of the underbrush which back in 2012, had made for an awful approach. It was this section of bushwhacking that had triggered Joel’s allergies leading to his asthma attack. 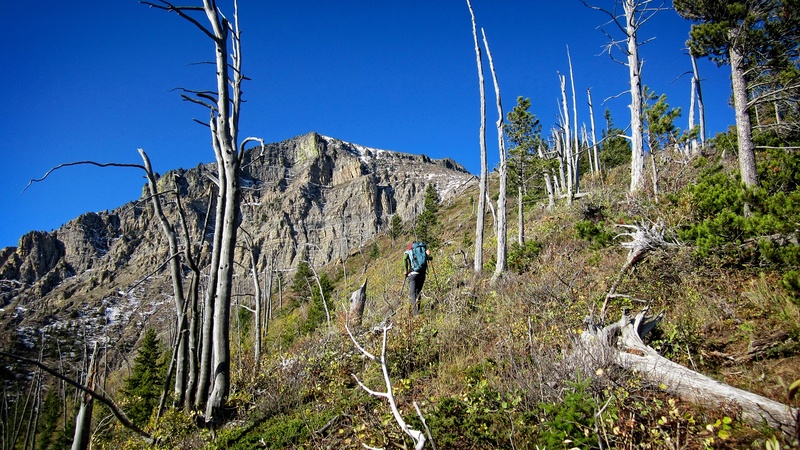 It’s not long after you reach the open slopes of the ridge that the first peak of Syncline Mountain appears. Looking southwards down the valley towards Castle Mountain Ski Resort. Southfork Mountain and Barnaby Ridge are on the left and Granvenstafel Ridge and Mount Haig are on the right. Rainy Ridge and Three Lakes Ridge are in the centre. 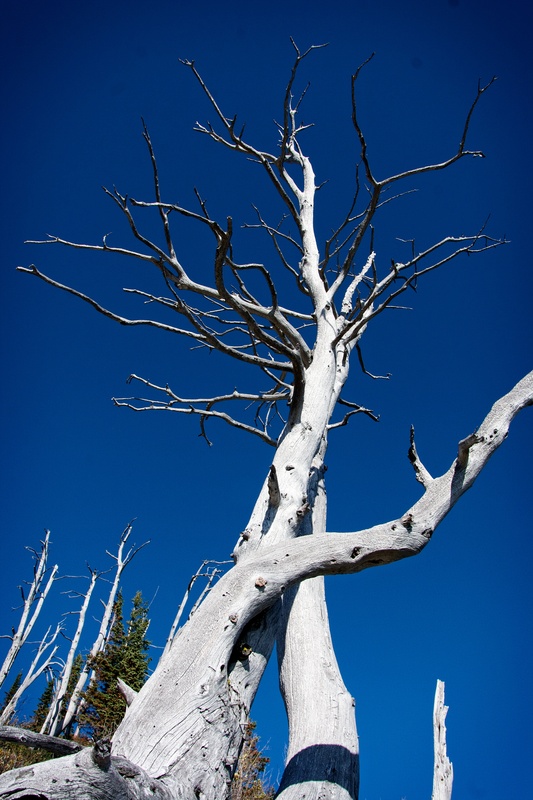 Several old, weathered trees add to the beauty of the day. Mark, Alex, and Jeff pause to take in the sights below. Southfork Mountain and Barnaby Ridge are in the background. 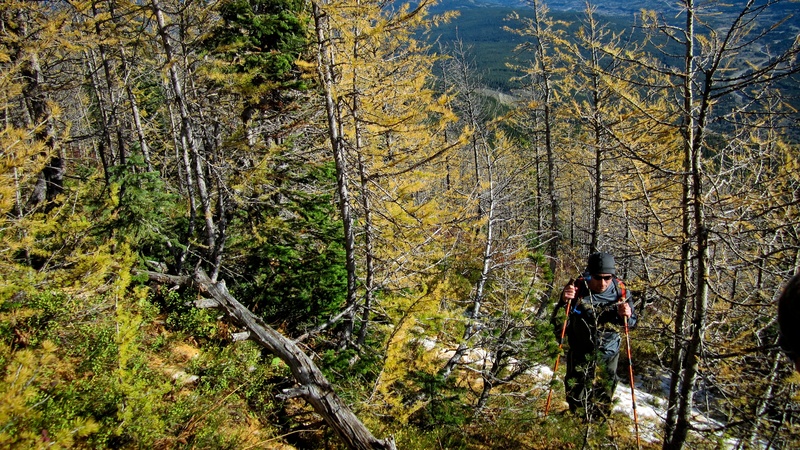 Jeff makes his way through some of the last remaining larches with needles. If we had been a few weeks earlier, the colour would have been dazzling. Near the top of the ridge, the terrain changes to rubble. 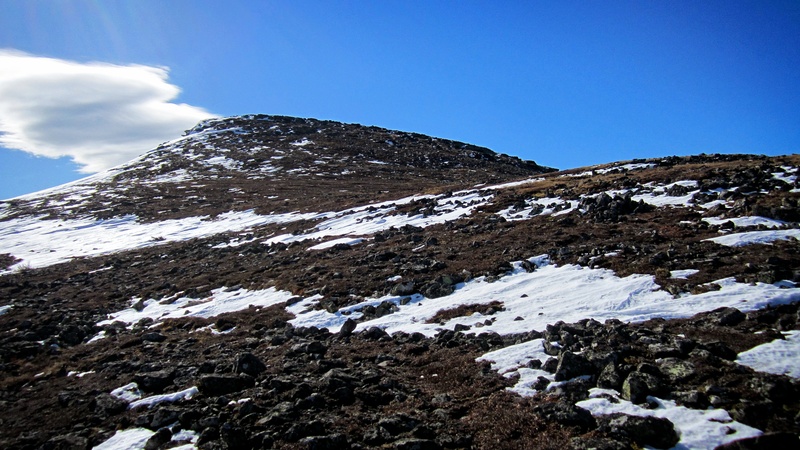 The route to the summit goes between the two rocky outcrops behind Mark. Jeff makes the transition from the grassy ridge to the rubble field. The unique forms of Castle Peak and Mount Windsor are clearly visible in the distance. A closer view of the passage between the two outcrops. 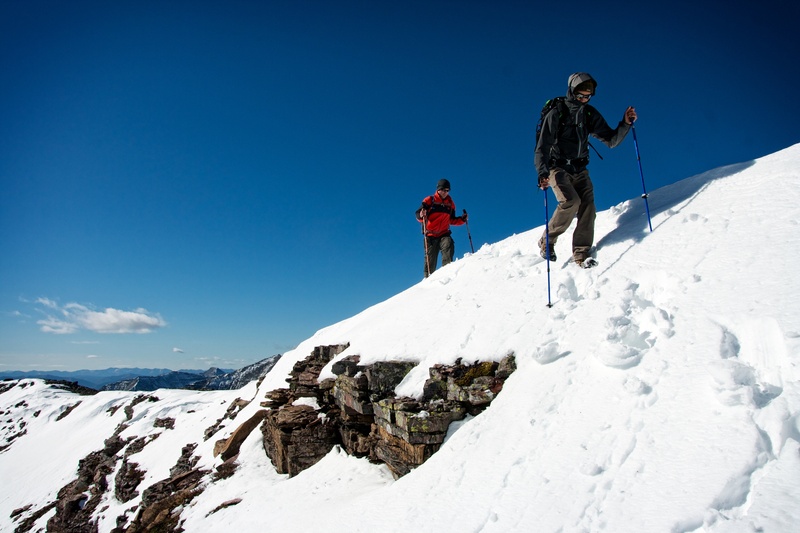 Once above the outcrops, the summit is not far away and travel remains easy. The summit of Peak 1 comes into view. Here is where we geared up to face the wind. Mark and Alex stand beside the summit cairn of Syncline’s first peak (my GPS read 2440m for elevation). Looking to the east and southeast from the summit. In the foreground is Southfork Mountain and Barnaby Ridge. In the distance is (from left to right): Table Mountain, ‘Table Top’, ‘Eagle Peak’, Prairie Bluff Mountain, Whistler Mountain, the old Whistler Fire Lookout, Mount Gladstone, Victoria Peak, Drywood Mountain, Loaf Mountain, Castle Peak, and Windsor Mountain. 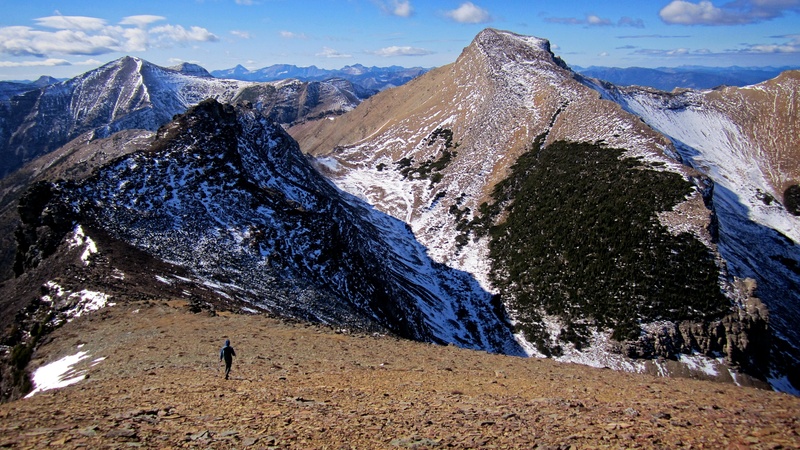 Looking south from the summit (from left to right): Barnaby Ridge, Rainy Ridge, Three Lakes Ridge, Gravenstafel Ridge, Mount Haig, and Tombstone Mountain. 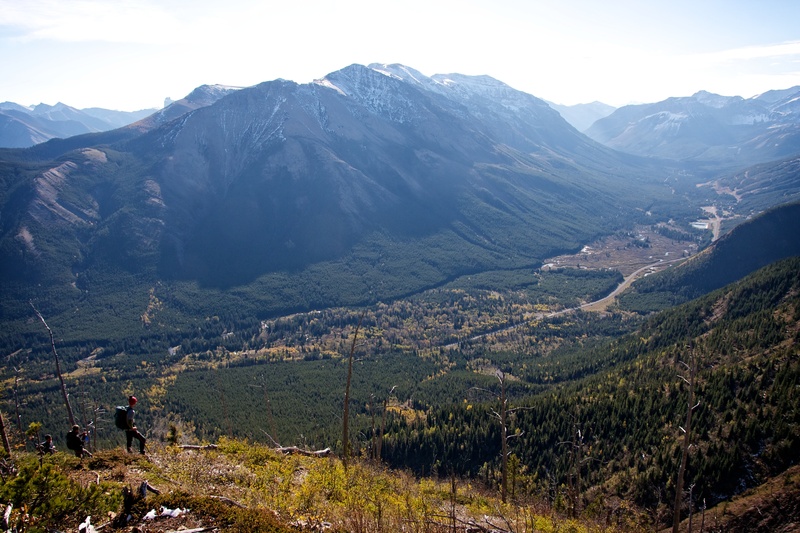 Looking southwest from the summit (from left to right): Gravenstafel Ridge, Mount Haig, Tombstone Mountain, St. Eloi, and Peak 2 of Syncline Mountain. Looking west towards Peak 2 (left) and Peak 3. 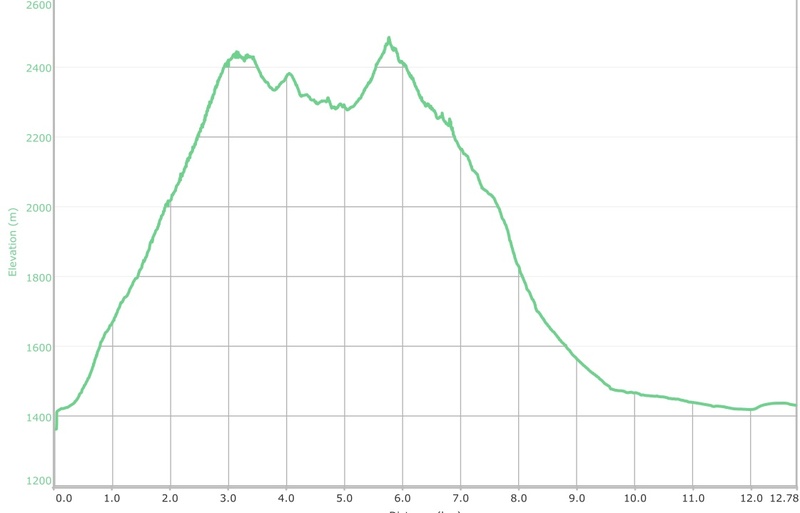 Peak 2 (my GPS read 2482m) is higher than Peak 1 and Peak 3 comes in as the tallest of them all. Another view west at Peak 3 with Mount McCarty in the immediate background. 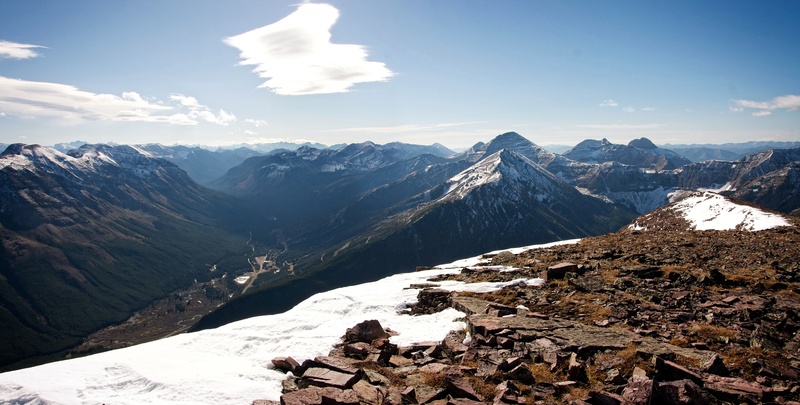 Looking northwest from the summit (from left to right): Mount McCarty, Centre Mountain, Mount Darrah, Mount Pengelly, Mount McGladrey, Mount Coulthard, Mount Tecumseh, Crowsnest Mountain, Ma Butte, and McGillivray Ridge. 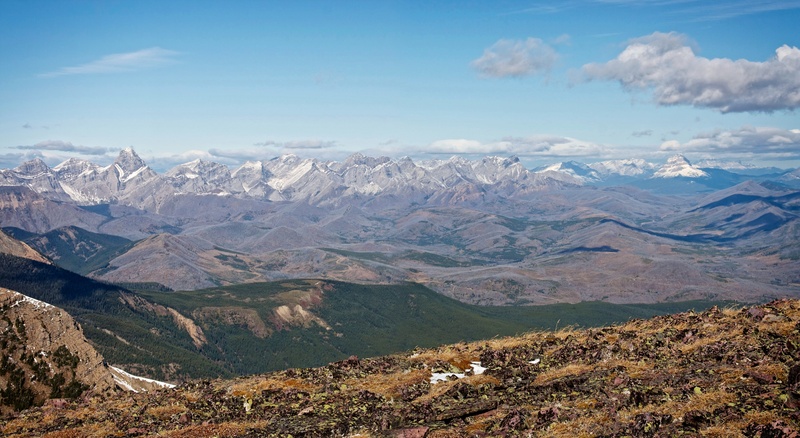 Looking north from the summit (from left to right): Crowsnest Mountain, Ma Butte, McGillivray Ridge, Hillcrest Mountain, Centre Peak Livingstone Range, South Peak Livingstone Range, Robertson Peak, Tallon Peak, Poker Peak, Maverick Hill, Byron Hill, and Carbondale Hill. Looking northeast from the summit. The fire lookout on Carbondale Hill is in the centre and little Mount Backus is on the right. Maverick Hill and Poker Peak are on the left. 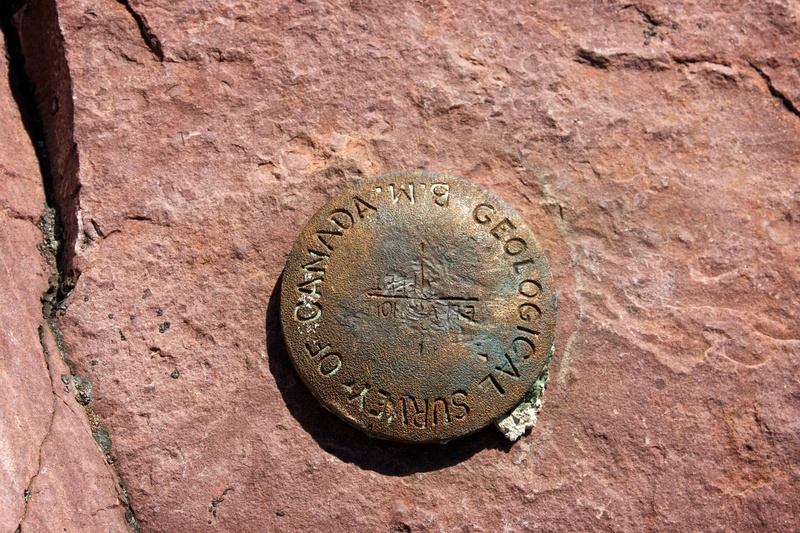 The survey pin located next to the summit cairn. 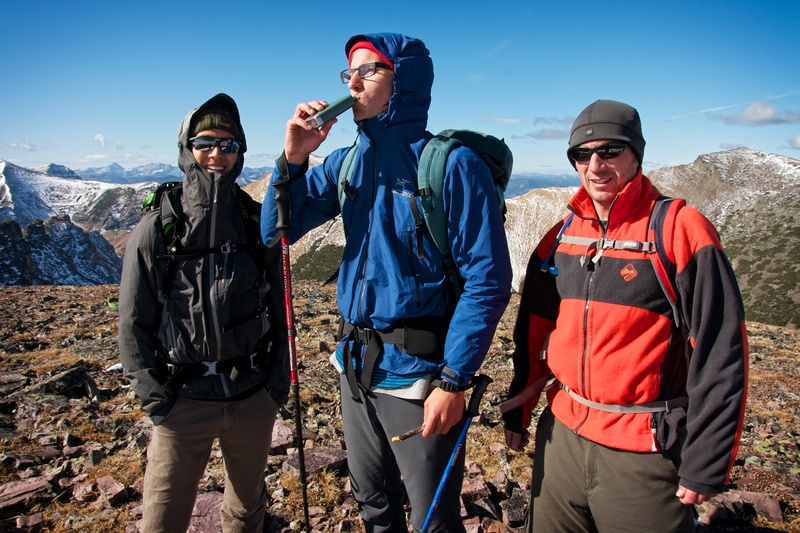 Mark enjoys a sip from the flask of 12 year old Scotch that I carry in my pack as we toast our arrival on the summit. It only took us 2.5 hours from the vehicles to the summit. 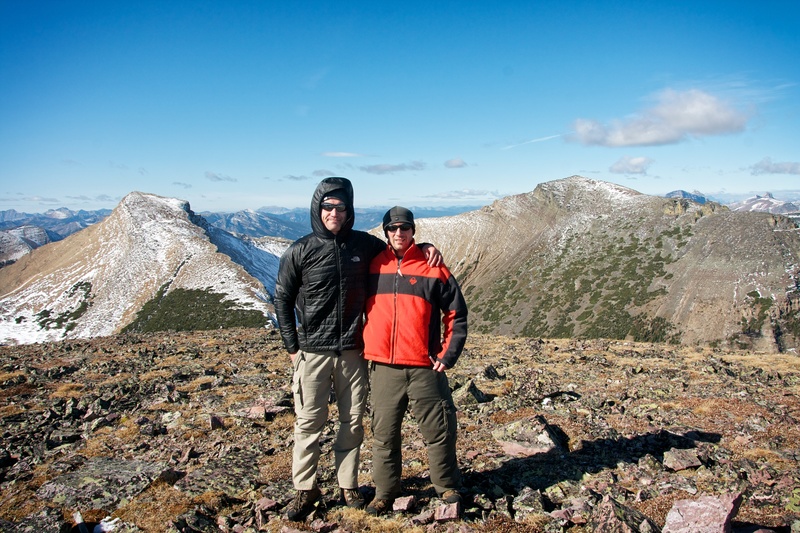 Buffeted and somewhat inflated by the wind, Jeff and I pose between Peak 2 and 3 of Syncline Mountain. Alex holds up a rock shaped like a Pez dispenser – the first of many uniques finds on this day. Another look to the south at Castle Mountain Ski Resort. 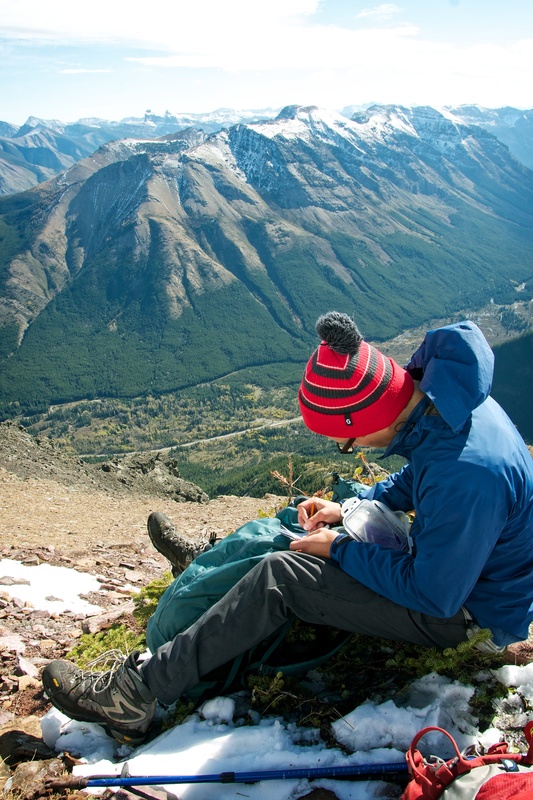 After several minutes on the summit, we grew tired of the wind and headed down the ridge to find a sheltered location to sign the summit register and eat some lunch. A telephoto to west before leaving the summit. Mount Darrah is the tall peak on the left. 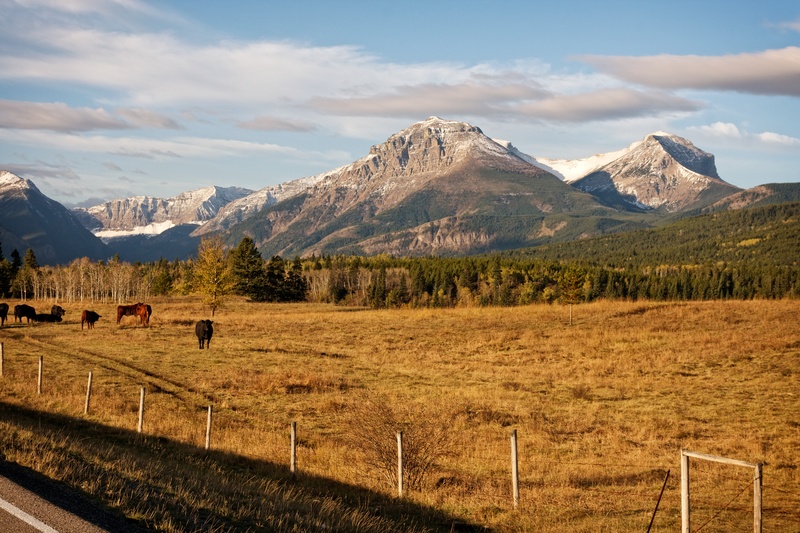 Mount Coulthard, Mount McLaren, Mount Tecumseh, and Crowsnest Mountain are also visible. Alex and Jeff trek through the snow as we drop back onto the east face of Peak 1 to find relief from the wind. Jeff, Alex, and Mark hunker down to eat lunch and sign the summit register. The summit is on the left. 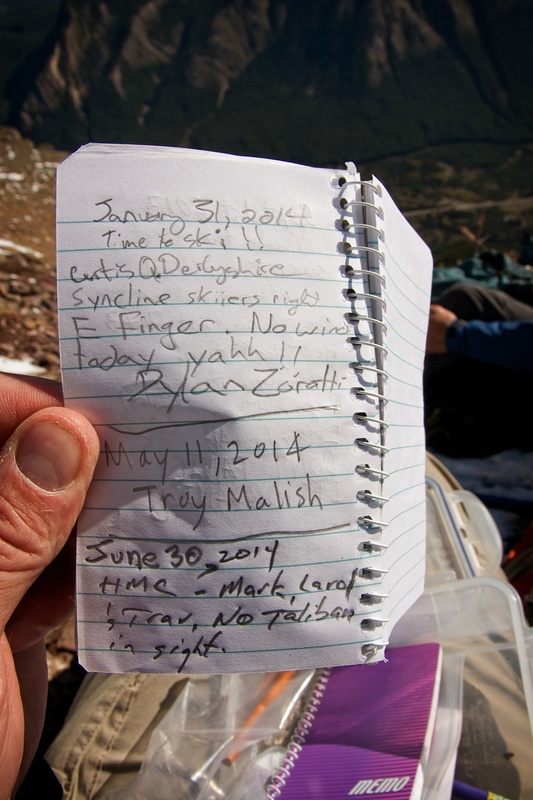 The register turned out to be a geocache that had been placed on the summit in 2010, however, the log book inside functioned as the register. 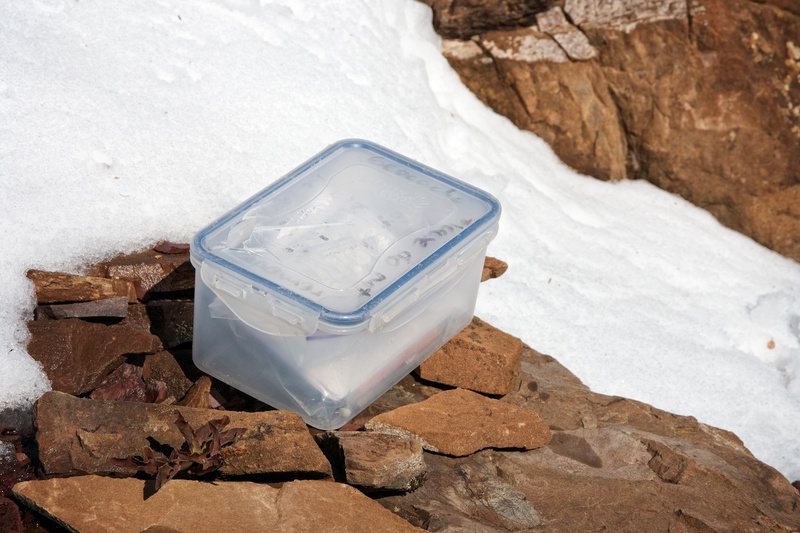 It was a good thing that everything inside was sealed in a Ziplock bag because the Tupperware container had a hole in the lid. I was quite surprised to learn that we were only the fourth party to have come up the mountain in 2014. Even looking back to 2010 it doesn’t appear that this summit is visited all that often despite the fact that Nugara includes it in his guidebook and given its close proximity to Highway 774. Mark signs the register as Southfork Mountain and Barnaby Ridge provide a beautiful backdrop. One last look to the east from our lunch spot before heading back into the wind. Since we had summited Peak 1 so quickly, we contemplated continuing on to either St. Eloi (distant left), Peak 2, and/or Peak 3. After a brief discussion, we decided to head to Peak 2 as we figured that it would provide us with some shelter from the wind on our approach. 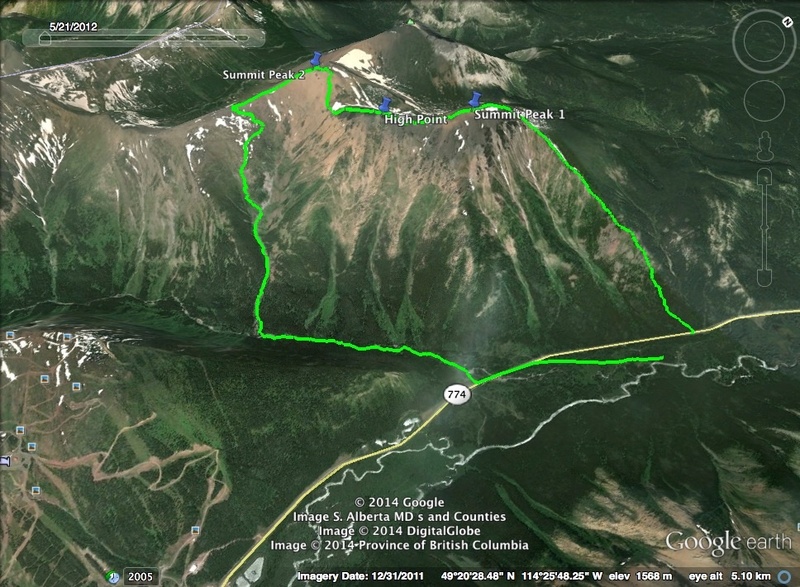 Not wanting to backtrack and regain the elevation of Peak 1, we decided that from the summit of Peak 2, we would walk south along the ridge towards St. Eloi and then drop into a clear drainage that led back to Syncline Brook and then back to the road. Click to continue onto Peak 2.